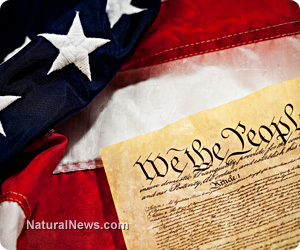 (NaturalNews) The disdain many of our "Old Guard" elected leaders have for the very Constitution to which they have sworn an oath to observe and uphold is routinely on display these days, perhaps because We the People have, for far too long, neglected to hold them accountable for their miscreant deeds. This dismissive attitude reared its ugly head once again recently when top Senate Republican Lindsey Graham of South Carolina suggested that Americans who blog aren't really reporting in the traditional sense, and as such may not be entitled to First Amendment protections. "'Who is a journalist' is a question we need to ask ourselves. Is any blogger out there saying anything - do they deserve First Amendment protection? These are the issues of our times." The "issues of our times?" Since when has the First Amendment been subject to congressional approval, senator? Then again, this whole thing begs the larger question: Why the need for a "media shield law" at all, given that the First Amendment already guarantees freedom of the press? Graham's riffing on constitutional law exposes one of the age-old tensions between journalism as a product and journalism as an activity. What Graham really meant to ask was whether bloggers deserve the specific protections of the First Amendment that are granted to the press. Actually, Graham should be asking questions directed at President Obama concerning his attorney general, Eric Holder, who has admitted that he personally signed off on the order permitting Justice Department and FBI officials to obtain the reporters' phone records as part of an investigation in the leaking of classified information. He might start with this one: "Mr. President, when are you planning to fire Mr. Holder? Graham didn't give specifics on the law, but said it would make it more difficult for the government to get a reporter's notes and strike the right balance between freedom of the press and protecting national security interests. Asked how he'd determine whether someone is a journalist, Graham said it would likely take some revision of DOJ guidelines to make sure they're up to date with current technology and the new media landscape. The DOJ hasn't updated its guidelines about how it investigates reporters since the 1970s or '80s, Graham said. Yes, well, we now know how the Justice Department investigates reporters...don't we? Lashing out at the press has been regular fodder for the Obama Administration, which is ironic given the media's fawning over the president since being elected to his first term. In 2009 - the last time Congress worked on a media shield law - Clint Helder, writing in the Columbia Law Review, said, "Are journalists best defined by the act of reporting (what's known as a functional definition), or by how they are employed (a status-based definition)?" "You can sit in your mother's basement and chat away, I don't care. But when you start talking about classified programs, that's when it gets to be important," he said. "So, if classified information is leaked out on a personal website or [by] some blogger, do they have the same First Amendments rights as somebody who gets paid [in] traditional journalism?" A better question would be to ask if the First Amendment makes such a distinction. Personally, I don't believe it does. Keep in mind a reporter (or a blogger) wouldn't have anything to report if someone hadn't given them the material. If that material was improperly released, that is where violations of the law occur, not at the (real or virtual) printing press.